No problem, this can be modeled by adding a stat to the statcard (which are a given for these kind of games). Still, if I list each gun seperately, it will require quite some downtime to determine which guns can fire together. So I decided to add all the guns of the same type and in the same arc into one profile. 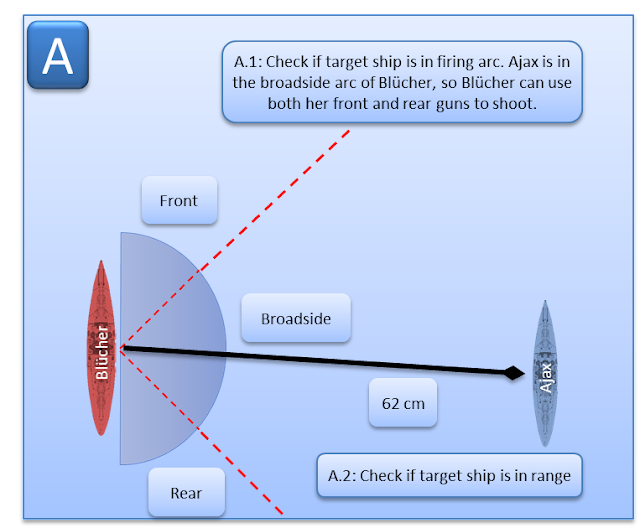 For example, Bismarck will have 4 15" guns firing in its forward/broadside arc and 4 15" guns in its rear/broadside arc. This speeds up play, saves a load of space on the statcards. This roll violates the details limitation and the fast play limitation. The addition of a second roll will slow down play by a lot, as will a big table of modifiers and the to hit table. Are there any benchmarks that I can take inspiration from here? 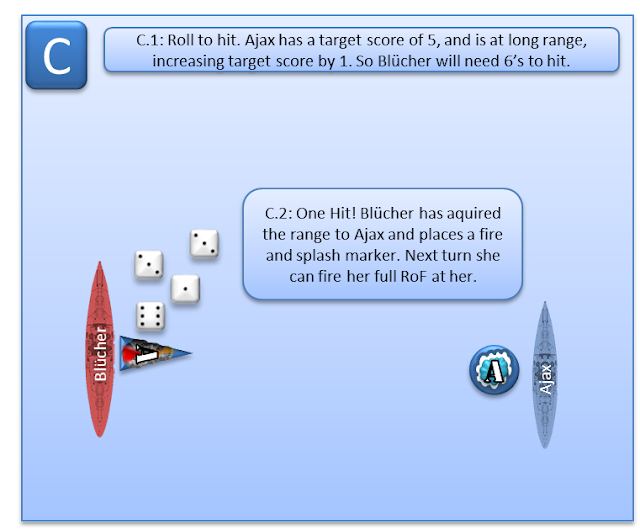 War at Sea uses a fixed amount of dice per gun type, only modified by range. This is an extremely fast way of modelling gunnery, but no distinction is made between front or rear armament, and the mechanic fails when taken out of its gaming environment, so this is not usable. Victory at Sea uses the second roll for 7,8 and 9, but has a nice small table with modifiers, so there might be something useful there. Naval thunder uses a D10, so that takes care of most of the problems, but since I’m stuck with D6’s I wont be able to use anything there. I started out by abstracting the to hit roll. I removed the table and added a ‘target score’ to the statcard of each ship. 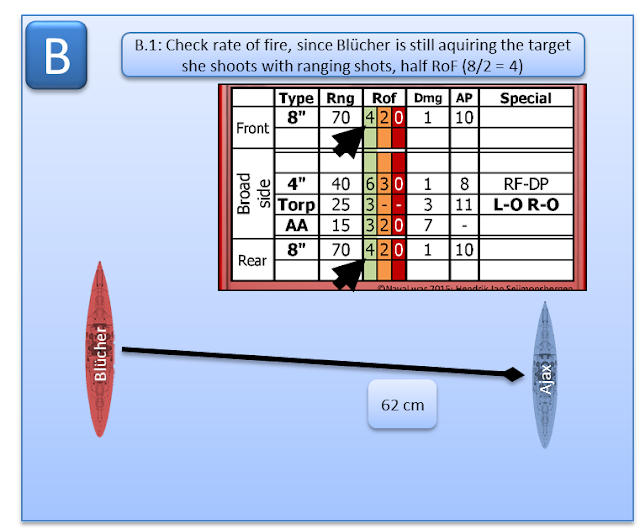 These target scores are predetermined by size and speed of the target, so as a general rule, destroyer sized ships will be hit on a 6, cruiser sized on a 5+ and battleship sized targets on a roll of 4+ on a D6. The target score on the card is actually only needed because some classes of ships will not fit neatly into one of those three categories. Usually the target score can be guessed by only looking at the model. So this will make the mechanic fit within the limitations. The second problem that arises is the limitations of the D6. A roll of 6 gives a 17% chance to hit. Which, in a lot of situations is still a to big chance to hit some small craft like fast destroyers. A second roll will further decrease the hit%, but this is not a good solution in my opinion since I only want one roll. My plan is to ‘wrap’ this second roll into one of the following rolls, more on this later. Bottom line is that only one ‘to hit’ roll is desirable considering the limitations of my design. In my opinion this is about the minimum basic modifiers needed for play. Some special actions on the command station might be added to this, but since they are on the command station, those come into play very pronounced, so a player does not need to remember anything but these 4. This brings this part of the mechanic in line with the limitations. A player should be able to remember these by heart after only a few shooting activations. However, this leaves the problem of damage. At first, I gave every gun a damage rating, which meant that each hit would cause the loss of a fixed amount of hullpoints. The problem is that this is highly unrealistic even for an abstracted game. This would reduce the damage model to a binary model, either you cause maximum damage, or you don’t. Fact is, that depending on which part of the ship you would hit, damage would vary because armor thickness would vary and a shell passing through the superstructure would cause less structural damage than a hit below the waterline. The first fix would be to vary the damage value. If you change it to a D3 or D6 roll, the desired effect is achieved. It would however, add another roll, which is beyond the limitations set. The solution in my opinion is to change the sequence. This would require quite a bit of abstraction, but would give a very satisfying result. If you apply the damage score before the armor roll, which would mean that you would roll more armor dice for each high damage hit received, this will take away the extra roll and still give variable damage. So when a ship receives a hit from a weapon that causes 3 damage, you take 3 armor rolls. This will result in anything between 1-3 damage, without an extra roll. Finally there are the loose ends: Plunging fire and the need to further reduce the to-hit chance of the first roll for small ships. The first problem can be solved by a simple single modifier: add one AP when firing at extreme range. This might not be the ultimate representation of plunging fire, but it does make long-range fire more effective. EDIT: Playtesting for the win!... After playtesting the above mechanic has been changed some more. Since the single modifier was a bit of an odd rule, I changed the mechanic by removing the modifier and replacing it with a change to the armor mechanic. Instead of 1, a ship now has 3 armor values: Deck- and Belt armor, and weak spot armor. Depending on the weapon or distance, a different armor score is used. The second is more tricky. Since destroyers usually had no more armor than splinter protection on vital parts, the DD usually ends up with not having to make an armor roll at all, the AP of most shells will be to high for its low armor value to counter in any way. That’s why I introduced a rule that an armor roll of ‘6’ is always a successful save. One could imagine this being a hit doing no damage because it passed straight through the ship and detonated beyond the ship, if it detonated at all. Mechanics-wise, it is just a way to reduce the hit chance a bit further for destroyers. Play testing will show if this is enough to help the fragile destroyers survive a bit more. I have one roll left in my mechanic to factor in critical damage. Most games have a trigger (for instance a roll of 6 or 1 on the armor roll) to let a hit cause critical damage. When playtesting I found out that this mechanic is a bit crude since it is usually forgotten (ow, did you remember if that last roll had a 1 in it?) and it does not link with the reality that most hits on a ship would hit at least something beyond general hull damage. Ships were bristling with all kinds of equipment and most hits would at least damage some secondary’s or AA-guns that were bolted down on every spare inch of the ship. So I figured that receiving hits that caused any damage would require a roll on the component damage table. 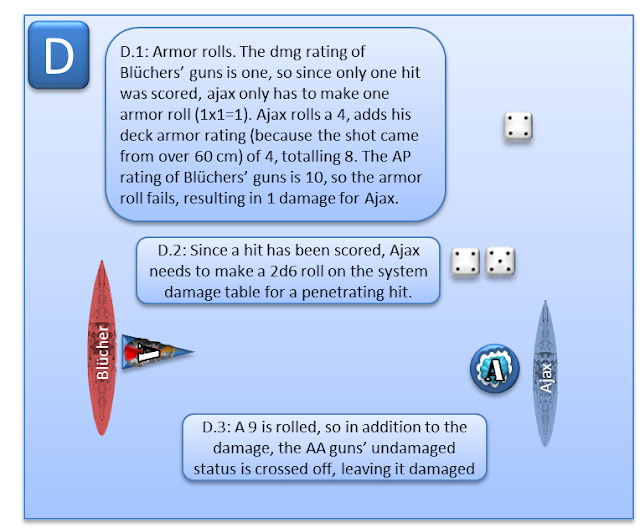 Multiple hits from the same ship will not require more rolls, an abstraction to speed up play (one salvo causing 4 different damage effects would be realistic, but would also slow the game down immensely). Instead, if you score 3+ or 5+ hits, additional effects happen that further increase damage or increase the severity of the effect. Furthermore, since the new armor system causes some armor values to be immune to certain guns (while in reality, those guns would still be able to damage the superstructure), I introduced non-penetrating hit component damage. If a ship is hit, but successfully negates all hits by its armor rolls, the ship will still suffer a non-penetrating hit effect (possibly starting a fire etc.). These tables have been reduced and abstracted to 12 component damage entries, so one roll of 2D6 will cover all possible component damage. This is also having the added effect in that the table is not to hard to remember by heart after a few games. Playtesting: After playtesting it became clear that long-ranged gunnery started to do damage from the first attempt on, especially for ships with large amount of guns. This didn't feel very realistic because ships tended to spend some time finding the range first before switching to rapid fire. To simulate the ranging and spotting before a gun battle, I've introduced the "Ranging shots" rule, allowing ships that did not find the range yet only half their total RoF. Subsequent playtests showed that this reduces the amount of first shot damage situations. More playtesting is required to see if this solves the problem or creates new problems by itself.